This is my Tamiya P-47D Razorback built OOB other than an Eduard harness and Albion Alloys slide fit pitot. The main camo colours are from the Gunze Aqueous and Tamiya ranges with Vallejo for internal detail. I left her in a soft sheen finish as I found a full Matt coat kills the effect of the delicate shading. I flatted the tyres and gave the spinner a polished aluminium Alclad2 topcoat over Tamiya Gloss Black. The drop tank was an early effort at marbling. Not entirely successful but less boring than monotone. 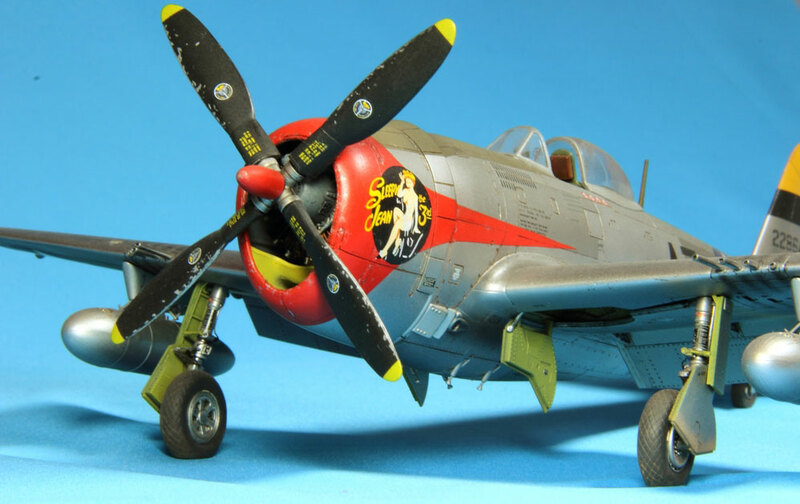 The Tamiya P-47D is a truly exceptional kit with precise detail and no fit issues whatsoever. The wings are almost snap fit. I really enjoyed this build and have done others since. Here’s my 1:72 scale PB4Y-2 Privateer – old Matchbox kit. In that last photo you can compare Privateer’s size to B-24 Liberator. Wrapped up the 1:48 Revell/Monogram Catalina. Special thanks to Javier Ruberto for all of the help with the graphics necessary for me to make the custom decals. 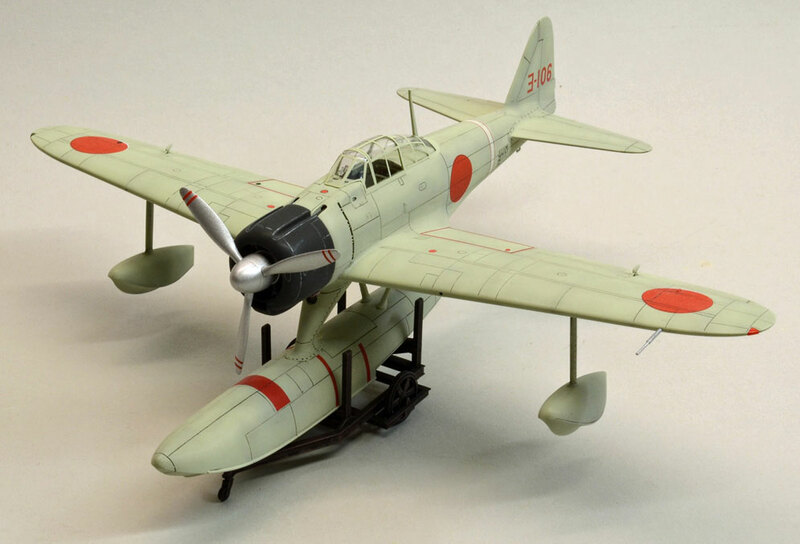 This is my Hasegawa 1:48 Nakajima A6M2-N Rufe which I have built out of the box. The kit makes up very well, as do all Hasegawa Zeros; I just added seat belts from the Eduard Japanese Navy set. The aircraft was sprayed using Xtracolor IJN green/grey and the panel lines were post-shaded with a darker tint. A mixture of gloss black and gloss blue were used on the engine cowl. I used a dark brown acrylic ink in the panel lines. An Eduard masking set was used for the canopies which makes life a lot easier and after applying the decals the entire aircraft was sprayed with Humbrol matt cote. Painting the model involved a lot of masking. First the control surfaces were sprayed with Xtracolor IJA grey. These were then masked off and the leading edge yellow/orange was sprayed. This was then masked off and the white areas under the hinomarus sprayed, together with the fuselage band. The white areas were masked off and the remainder of the aircraft sprayed with Humbrol 11, thinned 1 part paint 4 parts thinners. When completely dry the anti-glare panel along the top of the engine cowl and fuselage was masked off and sprayed satin black. The Ki44 was a very small, powerful interceptor with a wing span of 9.45m compared to that of a Spitfire with a wing span of 11.23m. The tail area was also unconventional with the tail plane set well forwards of the fin. The Nakajima Ha-109 14 cylinder double row radial was originally intended for bomber aircraft and produced 1520 hp. This large engine was successfully incorporated into a much smaller narrow cross section fuselage. The Ki44 is a very interesting and unusual aircraft which is one of the reasons I built it! 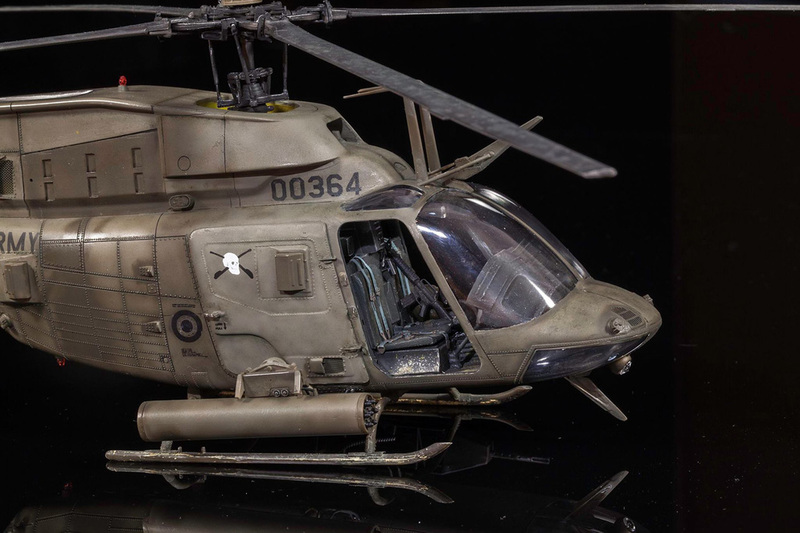 Here’s my recently finished OH-58D Kiowa Warrior in 1:35 made from the Academy kit. My kit is the Trumpeter 1:32 P-47 Thunderbolt, painted with Alclad2 Airframe Aluminium, Tamiya/Vallejo acrylics; kit decals (very good). Weathered with Flory Models Dark Dirt and thinned Tamiya Smoke (X-19) for streaks and stains. Additional extras used: Model Design Construction (MDC) P-47 cockpit, again painted with Tamiya/Vallejo acrylics and weathered with Tamiya weathering pigments. Engine painted with various Alclad2 metal shades and detailed with fine fuse wire (A first for me!). 3 years on and off to finish, one more off the shelf of shame. 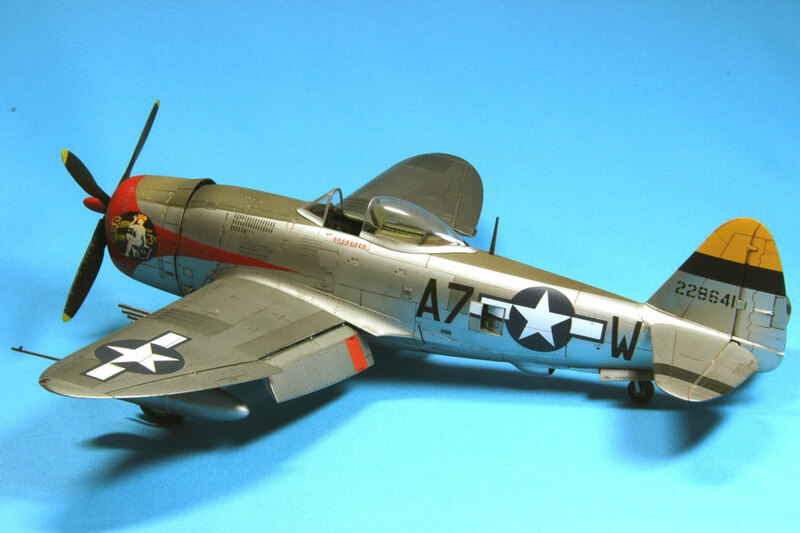 This is the Trumpeter 1/32nd scale kit and is not only the best P-47 kit on the market but in my view the best kit I have ever built, up to now! It’s packed with detail, fits beautifully and has great decals too. I built it straight from the box except the engine which I ‘wired up’ using copper and brass wire. I will be building many more of these and the ‘Bubbletop’ will be next. Superb in every way. This is my 1:48 scale Tamiya P-47D “Bubble Top” Thunderbolt. This was a straightforward build with no problems encountered along the way. I added an Eduard photo etch set in the cockpit with a resin replacement engine from Quickboost and replaced the wheels with True Detail items. The painting was done with Alclad and Tamiya paints. The decals come from Eagle Strike productions sheet American Jabos Part 2. This sheet supplies the black ID markings and also the red markings for the engine cowlings and fuselage. However, I decided to mask and apply these markings with an airbrush. The painting decaling and light weathering was brought together with a coat of Humbrol semi-gloss. This is my Trumpeter 1:32 scale P47N “Red e Ruth”. Pretty much out of the box with addition of gun barrels from Master and decals from Kits World. Paints used from Mr Hobby and Vallejo, with a mix of various Vallejo Aluminium, principally the new Metal Colors but with some of the standard Model Air range to get a varied metal effect between specific panels. A massive kit for your money! The power and technology of the real aircraft is really emphasised when contrasted with P26 Peashooter on my display shelf. Here it is some two years in the making!! “This is the Trumpeter 1:32nd P 38. This was not unfortunately made out of the box! If I had I think it would have been a straightforward build. But as I never seem to be able to resist the aftermarket….? As a result I had numerous fit problems which resulted my “putting it down(nearly literally)” for a long while. It stood on the shelf staring sadly at me and in the end I relented and put some decals on, resting again afterwards. The cockpit was from Grand Phoenix and was actually very good looking but it was too low and despite trimming and trimming it and the wheel wells, were still out of place when I assembled it all together. Now something of this size is not the easiest thing to fiddle around with and I felt it was going to lose its wings every time I handled it. In the end I blame myself for not following the pre fit all the way through. Otherwise I used the Big Ed metal and masks – these were very satisfactory. Here’s a model I completed recently and if possible you might consider entering it into your Subscribers’ Gallery. The Hasegawa model was made OOB with the addition of Eduard seat belts. Vallejo ModelAir paints were used throughout and post shaded with pro-modeller Dark Dirt clay wash. Klear was used at the decal stage and then a satin coat. The only issues I had was the separate tail section which required quite a bit of work to make it blend in. All in all a very nice kit to build… Vaughan P.
Modified 1:32 Trumpeter kit using Draw Decals and Tamiya / Vallejo paints. The prototype was sponsored by Hollywood actor and air force Brigadier General Jimmy Stewart to enable Joe Debona to win the 1949 Bendix air race. 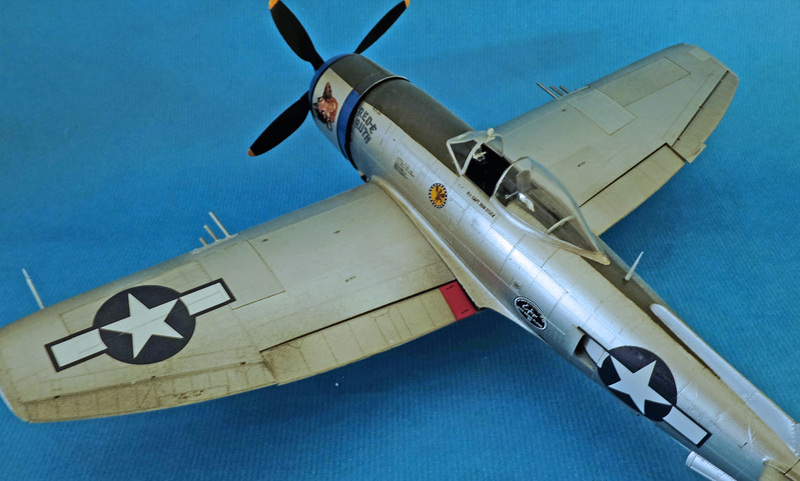 This P-51C Mustang has been built from the much favoured Tamiya RAF Mustang III kit in 1:48, the only thing that differs from a P-51C and a Mustang III in real life is the paperwork, i.e. which country or state ordered the contract to build a batch / block of aircraft. So for modelling work no problems arose to turn a boxed British machine into a USAAF variant. I wanted the model to be shown with the panels off and the Packard Merlin on show, this was a very straightforward task, by removing the forward section of fuselage halves along the desired panel lines. The Packard Merlin kit is an Aires resin product as the Tamiya kit does not offer this option, and if you follow the instructions for build from them you should have no problems with the assembly. All paints used during the build were Tamiya Acrylics, Tamiya weathering packs for exhaust stains and 50.cal stains; the overall model had a coat of Matt varnish from Vallejo, and panel lines flushed through with Mig wash. The chosen scheme has been based on Lt Ralph ” Kid ” Hofer’s P-51C 42-106924 QP-L of the 4th FG / 334FS 8th AF, Debden 1944. Lifelike Decals have a sheet of just that very aircraft of which I do recommend. Károly has kindly agreed to share this fantastic build with us all – some finish eh? The base kit is the Tamiya 1:48 P-51B Mustang offering and nice as that is, just look at what is achievable in terms of reality when you apply the effective weathering techniques that have become a bit of a trademark with Károly. I really do think that this kit is finished in the best ‘silver’ scheme I have ever seen on a model – simply stunning! Keep an eye on your SMN Techniques Bank – Model Weathering and Finishing Techniques area for some weathering tutorials by Károly. This is the Tamiya 1:48th scale North American P-51 Mustang released again in a box marked with “8th A.F. Aces”. Code TAM61089. I believe these markings are now discontinued. It came with newly-tooled clear parts that had better placed sprue gates. It also came with three new pilot figures (seated and standing) plus 3 decal schemes: Glamorous Glen 111, Old Crow, and Big Beautiful Doll. The decals are made by Cartograf, and of superb quality. I built my model in the markings of “Big Beautiful Doll” flown by Mustang Ace, Lt. Col. John D Landers. I used various shades of Alclad2 on the model, with Aeromaster Acrylics for the other colours used. The decals went on with no problem. The nose markings are in four parts, and lined up so well it’s hard to notice the join line. I painted the figures with acrylic paints, and gave them a wash with gouache. The cockpit is fitted out with Barracuda Studios resin detail set with the exception of the Instrument panel which is an Eduard Item. The cockpit was finished off using Barracuda’s excellent Placard and Stencil set. The seat belts are from HGW which as a bonus also includes a dinghy. The seat belts were a little fiddly to put together but far superior and natural looking than the etch brass alternatives. An Eduard Ammo Bay detailing set was used for the starboard gun bay. Again, I found the ammo chute links difficult to put together, the links being rather fragile when trying to bend them to shape! The wheels are resin replacement possessing a more natural sit than the kit items. To finish off the construction – Barracuda “compressed paper drop tanks” with plumbing added by myself using spare Tamiya vinyl tubing inserted with copper wire. The Mustang was finished with Tamiya Acrylics using XF-81, RAF Dark Green and XF-83, RAF Medium Sea Grey. Research suggests that there would have been a strong possibility of their use on USAAF A/C operating in the European Theatre. Decals are from an Eagle Cal sheet “To war with the Yoxford Boys” aircraft flown by Lt. Arvil Robertson in 1944. Neither one of them looked as though they might fit the Tamiya nose, so, using them as a guide, I airbrushed the checks using Tamiya masking tape, time consuming, but was happy with the end result. The obvious bonus of using this process, was that the same mix of red and yellow on the checks was used on the spinner for a perfect match. Weathering consisted of a wash using Flory Models Dark Dirt. After a coat of matt acrylic varnish, I used my favourite oil dot method borrowed from the armour boys to tone down the paint. The figure is from Ultracast and is finished with a combination of Tamiya Acrylics and oils. Well the model is the Tamiya 1:32 kit and it’s not actually flying at all! This is how I did it… it’s easy… take very thin nylon line, and put a small electric motor with small battery in the plane. I had to destroy the original motor from the kit a little. Then go outside on a hill or a high house and hold it out of the window. Natural light is important. A few clouds are also good for a good picture. This is my P-51D Israeli Mustang… I used the old Monogram 1:48 model kit. I re-scribed all the panel lines and hatches and sanded the instrument panel to the proper thickness so I could fit the decal in the back to give this cockpit much more realism. NMF probably in most modellers eyes can be really tricky and Not My Favourite! But this model came about as a result of eyeballing a P-51 at Goodwood some years ago. That is really what it takes to start a project like this. A real desire to build what you have seen. It was my first project in metal at the time and the fact it was trumpeters 1:24th scale kit shows how uninformed I was about the difficulties to be faced. Having enlarged the original image sufficiently to see what had happened to the surface a method of solving the problem was sorted out. It seemed to me that the general result of gradual oxidization was a greying of the aluminium on this bare metal aircraft. I liked this wear but I wanted a shinier finish. The greying I thought could be handled by the normal way of starting with a highly polished black base (gloss) and I guessed that the Chrome Alclad paint sprayed rather more generously than recommended could be rubbed back to create different textures. I used very light polish (like an almost dry T-cut) and masked off panels and, some I hardly touched, others I cut back enough to show some of the black through. I did this to the fuselage panels only and it worked well. So then I thought that I could see a bluish hue in some panels so I sprayed a thin (30%) coat of Tamiya Clear Blue over parts. As it happened it was easier to work in this scale as it was not so fiddly. Before starting to paint I had distressed the panels a bit using a small surgical blade (probably a 15) so the skin looked more “used”. This was done using a very light touch and spraying some gloss on to see the effect. Frankly this stressing only seems to be convincing in larger scales as otherwise it looks as if the aircraft has been involved in some sort of accident. I’ve been dusting off some old models and here is my Petlyakov Pe-2 Soviet dive bomber during WWII. It’s built from the Zvezda 1:72 Scale model kit. This Phantom is an FG-1 converted into an RAF FGR-2 – you will have to make some minor changes between the two variants but these are included within the kit, with the exception of the Slatless stabs which were just filled in with some Squadron Green and then sanded flat.The Aircraft was painted in Xtracolor XA030 Roundel Blue and various Alclad shades were used on the rear section of the aircraft. The decals were sourced from various kits (Revell FGR-2 kit, and RAF Phantoms in Germany). I have really enjoyed building this project and I am sure the new owner who I built it for will love it. I thought you might like some images of my latest finished project: a 1:48 Revell/Hasegawa Phantom FGR2 finished in the markings of 41 Sqn, RAF Coningsby circa 1974. The model carries the EMI recce pod on the centreline as 41 was a tactical recce squadron. Finished mostly from the box, but with Eduard zoom in the cockpit, and their RAF Phantom seat set. Decals are by Almark. Eduard 1:48th Weekend EditionThe first thing to strike you about this kit is the box that details a beautiful profile of this fighter in its role with the Republican Forces in the Spanish Civil War. The kit is beautifully moulded in traditional Eduard Olive plastic with some fantastic surface detail. The panels are a mixture of fine engraving and subtlety raised panels. The representation of the fabric surfaces is superb – probably the best I’ve seen in a plastic kit of this price, and the suggestion of the interior structure under the fabric is a real credit to the designers. The Cockpit is well detailed with excellent detailed levers; I decided to add some small pieces of wire to reproduce electrical cabling to add a little more interest to the pilot’s office only to find that when the fuselage halves are joined you cannot see any of this work! Unfortunately the cockpit floor is a bit inaccurate but I decided not to touch it because as I was keeping the cockpit doors closed almost nothing in the cockpit is visible, including the beautifully detailed instrument panel which I spent 2 hours hand painting! Eduard provided a decal for instrument panel, which in hindsight I wish I had used. Installing the pilot’s seat was a little tricky but if you carefully follow the instructions you can achieve the angles required. Once assembled it looks great and even better with the addition of some scratch built seat belts made from masking tape and copper wire. I glued the fuselage halves together and almost no filler was needed, it’s a shame the same could not be said for the fuselage to wing joint! No matter how hard I tried I could not get this joint to close using glue alone, so out came the plastic card and green putty to solve the problem. In the end the result was ok but I am still not happy about the seam on the underside of the body to the rear of the wheel wells. Next we had the nicely detailed engine, it is a shame that once installed it is hardly visible but I like to say I know it is there. I drilled the gun barrels and venture tube using a No. 10 scalpel blade just to add a little more realism. The undercarriage is precise and absolutely in scale. At first I thought it could easily snap but when I joined them (using cyno) it becomes a very compact and rather sturdy item. The undercarriage doors are a bit complicate to install but if you follow the steps in the instruction sheet it is really easy and if I may say with all those rivets look realistic and effective. At the very end I added a piece of buff coloured cotton from the centre of wheel hub to the small hole at the roof of the undercarriage bay to reproduce gear retraction system. I painted my I-16 using my usual Vallejo Model Air paints and applied lots of post shading via the airbrush (the ever faithful Tamiya smoke heavily diluted with liquor thinner) and applied heavy weathering, using Mig filters, pigments and oil washes as I wanted to represent a battle weary well-used fighter. This was a very enjoyable build but the best part of it for me was the painting stage. In its base colours it looked like something my 10 year old nephew would have done and it took a considerable amount of time to finally achieve the finish I was happy with. I know, it is certainly difficult to find a British Phantom operating in this condition, but I wanted to work a bit with a stronger weathering. This is my model of a British F-4 Phantom FGR-2 on No.56 Squadron, RAF Wattisham, Suffolk around 1992. Excellent kit the Fujimi 1:72 kit, with pretty nice details. I worked a few areas with Rosie the Riveter, added two Aires seats and some decals from AirDoc. The rest out of the box. Here is a beautifully made and finished model by Zdenko of the 1:32 Polikarpoz R-1 by Wingnut Wings. Zdenko says his model is built straight from the box with just the rigging added as usual – what a great build – I love the subtle weathering that gives such a high level of authenticity to his work. It’s also worth taking a look at the perfect composition and quality of his photography – we’ll be taking a look at model photography in your SMN Techniques Bank in the near future so keep an eye on that. Thanks again Zdenko for a great contribution to your SMN Subscribers’ Gallery.